Virginia Thompson is remembered not only as a beloved teacher, but also for her sense of humor, her kindness and caring, and her service to the IHS, including two terms on the Advisory Council (1995-2002) and a term as president (2000-2002). Virginia was born in Davenport, Iowa and attended the University of Iowa (BM, DMA) and the University of Arizona (MM). She taught horn at Coe, Cornell, and Grinnell Colleges and played in several orchestras, including the Orquesta Sinfonica de Xalapa in Veracruz, Mexico and as substitute with the Pittsburgh Symphony Orchestra. 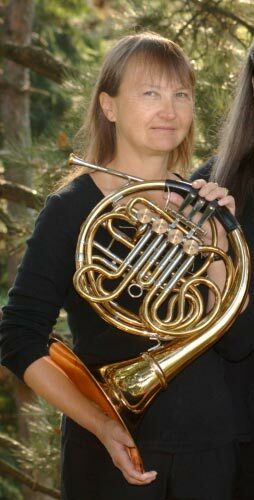 For the last 25 years Virginia was Professor of Music at West Virginia University, where she taught horn performance, literature, and pedagogy, was the Director of Graduate Studies (1996-2000), and was a member of the faculty Laureate Wind Quintet. Known affectionately as Dr. T, she earned multiple Outstanding Teaching and Service awards as well as acknowledgements of Continued Academic Achievement. Virginia had a special interest in new music, commissioning and premiering many new works during her career and collecting some of them on a CD, Music for Horn, in 2008. As soloist, recitalist, and clinician, she performed throughout North America, Europe, and Africa. See the obituary by Jennifer Presar and Heather Poe Roth in the May 2015 issue of The Horn Call.